I have a rash on the top right side of my back, is it something serious? I have a rash on the top right side of my back. I am sending a photo. I felt a slight burning and itching sensation for a couple of days and now have a burning rash about 5 inches long. It burns and itches a lot and doesn’t look good. Is it something serious? 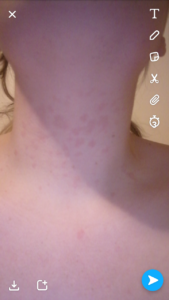 I have skin patches on my neck and chest since I my teens, could it be too much insulin? As a teen i started getting skin patches on my neck and chest. Dry not itchy or anything. Just wondering what it could be. I’m now 27 years old. So its been happening for some time now. I was once told by a Dr not being checked just her opinion that it could be because my body produces to much insulin. I’m no Dr but i just think that’s not what it could be. Id just like answers and to see what i could possibly do about it. I have strange “bites” or “rash”, please advise? Trying to find out what these strange “bites” or “rash” places are. Small red bumps in nearly a “V” shape. They do NOT itch. Not really any pain or anything. Maybe something viral? I have had something going on with RUQ abdomen into lower area toward hip, intermittent pain and bouts of nausea. Not sure if it could be related. The area on back of upper left arm appeared 1 day ago (a few random spots on other areas of left arm, maybe 4 other spots), area on mid/upper left back appeared today. 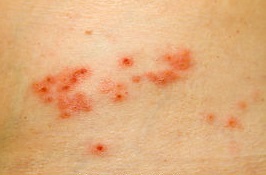 Thought possibly shingles but again, no itching or pain. Any ideas? My son is having this rash coming on his skin which looks like a heat rash? Hello,my son is having this rash coming on his skin which looks like a heat rash but I don’t think it’s is anymore because I have try lotion and Vaseline but nothing is helping which is making me worry about him. Please I need a second opinion before going to the hospital. I am experiencing a skin rash, especially below my eyebrows and near my eye? 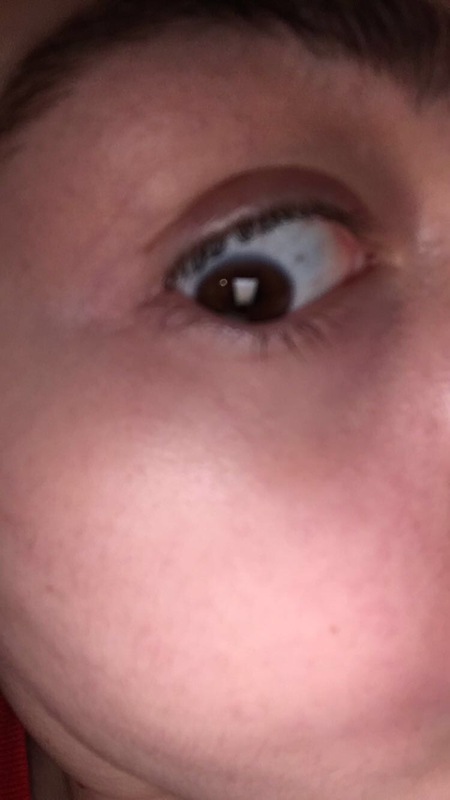 I am experiencing a skin rash, especially below my eyebrows and near my eye (white sometimes itchy bumps), eyelash loss, left eye twitching, eyelid inflammation, redness in tear duct, itchiness around both eyes but most in left eye, eye dryness, and small white flakes in hair. This has been happening for about two weeks. It started as an eye twitch in my left eye, and then became itchy. Now I have all of these symptoms. I have taken fluconzale, as well antibiotics. What is causing this?